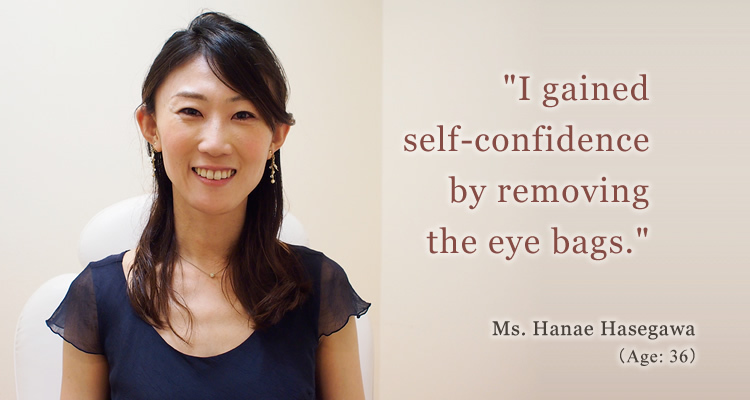 Ms. Hanae Hasegawa received treatment at Theory Clinic in July, 2013. She tells us how her lifestyle has changed. I am a piano instructor and also a performer. I occasionally play the piano at live events. Since I meet many people in my job, I was always conscious about how I looked with my eye bags. I tried to cover them up with makeup. ---It's been about a month since you received treatment. How do you feel now? I'm surprised at myself feeling so positive about my life. Before I received treatment, I was not confident about the way I looked. Now I feel good about myself. My husband is also happy for me. Receiving treatment was a valuable investment I made. ---What bothered you most about the eye bags? Whenever I was on stage during a live performance, I had to worry about how I looked with overhead lighting. I probably looked tired or unhealthy. Also, as a piano instructor, I wanted to look confident. ---How did you decide to receive treatment? I started being conscious about my eye bags as I reached my thirties. I tried muscle training and massage but nothing changed. I heard that my mother had her eye bags removed. I didn't want to wait till I get older like my mother; I wanted to do it while I was still young. ---How did you know about eye bags treatment? I regularly read a blog of Mrs. Ayako Tsutsui, Dr. Tsutsui's wife. When I read about the treatment on her blog, I got very much interested in trying it. I did a lot of research on the Internet and carefully compared the information provided by different clinics. Theory Clinic had a very high reputation and the cost was reasonable. Before and after pictures that are present on the clinic's website convinced me of the effect of the treatment. I was impressed with Dr. Tsutsui's track record in eye bags treatment. blog of Mrs. Ayako Tsutsui "give and given"
---How did you feel when you first came to Theory Clinic for diagnosis? I thought Dr. Tsutsui was rather young as a cosmetic surgeon. But he seemed totally reliable. At a glance, he understood my problems. He clearly explained to me about the type of eye bags I had, treatment method and after care. I quickly made up my mind to receive treatment at Theory Clinic. It probably depends from patient to patient, but I didn't feel any pain. The operating room had a very relaxing atmosphere, so I was comfortable all the time. ---How did you feel right after the treatment? There were only some needle spots on my cheeks. I had a very slight swelling. I had three days off from my work for the treatment. Swelling became a little worse on the next day, but it was gone before I went back to work. ---Please tell us if you have any additional comment about Theory Clinic. I had never been to any cosmetic surgery clinic before, so I was a little nervous at first. But once I walked in, my worries were gone. The staff was nice and very professional. The whole clinic had a relaxing atmosphere. I felt comfortable as if I was at a hotel and not at a clinic. I think there are many people who have eye bags problems but don't have the courage to have them treated. Thanks to Theory Clinic, I could gain self-confidence and have positive attitude toward my life. I want other people to have the same experience as I had.